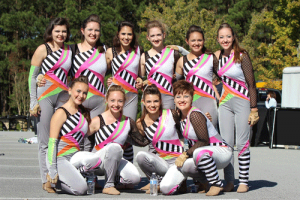 Color guard is an essential part to marching bands by providing visual and dynamic movements along with the music. New uniforms, flags, sabers, rilfes, tournaments, and competitions all cost money. To help offset those costs, Giving Bean is perfect for color guard fundraisers. With freshly roasted coffee, unique artisan teas, and gourmet all natural cocoas our products are hard to resist! Giving Bean’s coffee fundraising program has no start up costs, online support, step by step insturctions, and fast shipping. It is also easy and effective. With our traditional paper fundraiser you will make 40% as well as 25% from online sales. Giving Bean’s online fundraiser is a great way to reach customers who you wouldn’t normally be able to reach with a traditional fundraiser. With anything participation is the key to reaching your goals. Assigning each member of the color guard to sell a certain number of products will help you reach your goals easily. Giving Bean is super easy to set up last minute for anytime you need to raise some funds. It’s also great to run several times a year!